As pictured above, we will be creating an Android application that has a button and a text box in the home activity. When the user clicks the button an alert dialog with three buttons: No, Cancel, and Yes will pop-up. The text in the text box will change depending on the user’s selection. Furthermore the user is not able to close the dialog by simply clicking outside of it. As mentioned above what we need is a button and a textview. 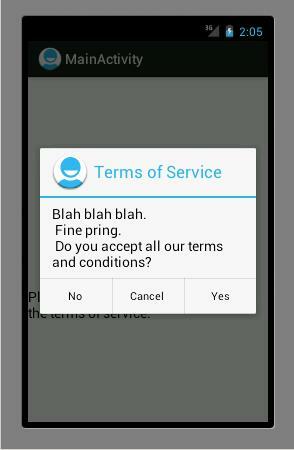 android:text="Please click on the button to accept the terms of service." Here is the code, scroll below it to see the explanation. The first thing we need to do is implement OnClickListeners for both the button and dialog, they each have their own method definition. We will now fill in the onclick method for the button. It is here were we will build and call our alert dialog from. Using the AlertDialog.Builder method we will set the various parameters for the dialog, some are pretty explanatory, as you’ll see, so I would like to focus on the ones you might not understand at first sight. The methods setPositiveButton, setNegativeButton, and setNeutralButton create our three buttons in the dialog alert. The first parameter of each of this methods is the text for the button, the second parameter is the listener for the button, since we implemented the DialogInterface.OnClickListener class in the MainActivity class or listener object is MainActivity’s object or "this". The seCancelable method prevents the user from closing the alert dialog by clicking outside of the dialog, the default is "true", I have set it to false however so that the user is not able to perform this operation. Now let’s take care of the OnClick method for the Dialog. Inside this onclick method we will handle the user’s selection. The OnClick method for the dialog gives us access to two parameters, the dialog object and an integer representing the button that was clicked called "which"
Using the which argument and a switch control flow we will change the text box’s change accordingly. The Android SDK has made available to use a set of constants which can be used to identify the button that was clicked. For example DialogInterface.BUTTON_POSITIVE goes with our "Yes" button that was created using the setPositiveButton method. And that’s how you make an alert dialog in android.